On 9 January 2018, the French National Energy Ombudsman organised a Morning discussion in order to review the two years of consumer mediation in France since the enforcement of the ADR Directive. In the opening, Claude Nocquet, President of the Commission of Evaluation and Control of Consumer Mediation (CECMC), presented the rigorous conditions that a candidate must meet to be referenced as a consumer mediator (Alternative Dispute Resolution entity). She recalled that the Energy Ombudsman had been one of the first three to be referenced in January 2016. She also stressed the importance of monitoring referenced mediators and ADR schemes. This introduction was followed by a first roundtable entitled “Between after-sales service and justice, has the consumer mediation found its place in France?”. The ombudsman for electronic telecommunications, Claire Mialaret, said that the consumer mediation had actually found its place, supported by figures. Renaud Le Breton de Vannoise, president of the Tribunal de Grande Instance of Bobigny, recalled that even though the legal framework of mediation and ADR was now well settled, all the involved stakeholders must now “change paradigm” in order to allow a more widespread use of mediation. Similarly, the president of the UFC – Que Choisir Alain Bazot insisted that, for mediation to develop further, consumer ombudsmen had to work to earn the trust of consumers. He also called for a generalisation of sectoral ombudsmen, a model that should be preferred over that of business mediators. During the exchanges that followed, Jean Gaubert reminded that when facing persistent bad practices, a consumer ombudsman should play a role of “whistleblower” without challenging the confidentiality of mediation. The second part of the morning aimed to bring a European perspective. It began with a presentation by Dr Naomi Creutzfeldt, Lecturer at the University of Westminster. She insisted that alternative dispute resolution mechanisms should be culturally sensitive in order to convince consumers of their effectiveness. After this presentation, the 2nd roundtable took place: “The European point of view. The benefit of ombudsmen and mediators in the energy sector”. 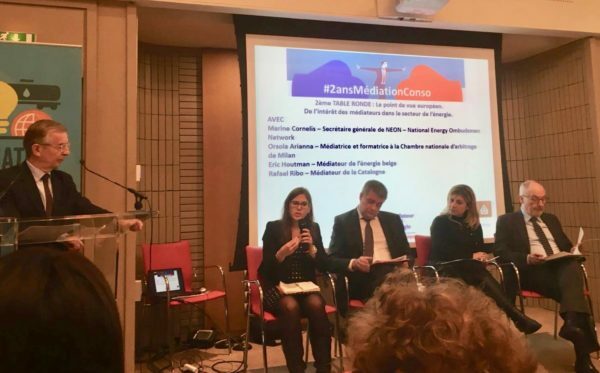 Orsola Arianna, Mediator and trainer at the National Chamber of Arbitration of Milan, provided an overview of the mediation processes available in Italy for energy consumers. She showed that the culture of mediation was very well established, in coordination with the courts. The Belgian Dutch-speaking Energy Ombudsman, Eric Houtman said that sectoral ombudsmen already existed in Belgium in various fields before the arrival of consumer mediation (ADR directive), but the transposition of the 2013 European directive on alternative dispute resolution had led to the emergence of government-approved “qualified entities”, as well as the creation of a residual complaint-handling service for unhealed sectors (the Consumer Mediation Service). The Ombudsman of Catalonia, Rafael Ribó, recalled that his power of control extended to private companies that provide services of general interest, and therefore to companies active in the energy sector. After presenting the main types of disputes he faces, he pointed out that the process to set up consumer mediation is still ongoing in Spain and Catalonia. Beyond the local differences, the Secretary General of the European network of energy ombudsmen and ADR (NEON), Marine Cornelis, insisted on the need to use a simple language with the consumers, what an ombudsman is naturally brought to do. In his closing remarks, Jean Gaubert praised the quality of the interventions and debates and recalled the specific role of the ombudsman, who must have good teaching skills. Watch the videos and read the full report (in French) on the French Ombudsman’s website.